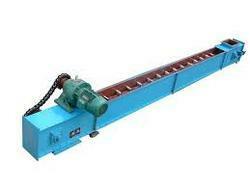 Chain Conveyors utilize a belt to transport the material and are control fed in one or numerous inlet areas. The bulk material rides on top of the belt and is contained by the belt trough or side walls. Conveying capacities up to 50,000 cubic feet per hour can easily be handled with our Conveyors. Chain Conveyors are ideal for conveying materials with large and varying particle size. Looking for Sprockets For Wet Scrapper Conveyors ?